These and similar questions are frequently asked. The book answers these in a manner that is easily understood. 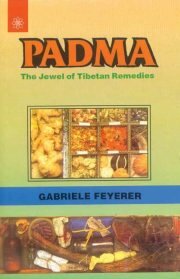 Gabriele Feyerer reveals the principles of Tibetan medicine as well as how its natural herbal remedies work. At the center of these considerations are two substance mixtures, which are being produced for this first time under the name of Padma. However other Tibetan formulas also follow the principle of variety in their ingredients. Plant remedies with many substances represent as aspect of the Tibetan medicine that distinguishes its practical applicability in a special way in the modern world. The formulas have been and continue to be subjected to internationally controlled medical studies for the purpose of distinctly documenting their effectiveness. Gabriele Feyerer Ph.D. a former lawyer has inherited a love of naturepathic healing from the grandmother an herb enthusiast. For more than 20 years she has been extensively involved in all types of holistic healing. Her special preference is Padma which has become part of her life. Her books radiate her loving devotion to this very special Tibetan remedy.